Ask the Art Prof: What Should You Include in an Art Portfolio for Art School or College Admission? Preparing a portfolio for college admission is not a casual undertaking, it’s very common for high school students to underestimate how much time and labor is involved. For most students it takes several months, even up to a year to create a body of work that is rigorous enough for the competitive art school and college admissions process. If you can maintain a prodigious level of production, the quality of your work will progress tremendously and you’ll have many more pieces to choose from. Even of the portfolio requirements state that you only need 15 pieces, this means you should aim to create between 20-30 pieces. Not only will your work improve from more experience, but you’ll be able to weed out the weaker pieces and emphasize only your best work. Artprof.org has a free Art School Portfolios Video Tutorial, which greatly expands on the content in this article, which includes videos of art school students giving tips, a gallery of student portfolios, and more! Every school is going to have their own unique set of requirements, so be sure that you check each school’s guidelines first. I recommend re-reading the guidelines multiple times as you’re working on your portfolio to be certain at every stage that you are following their precise requirements. On top of that, remember that several art schools and college also require that students create a few artworks specifically for their application on top of the portfolio. You’ll need to set aside time to work on these specific assignments in addition to creating the entire portfolio. The tips I offer below are basic essentials that should apply to most schools. 1) Create original work from direct observation. This is hands down the number one, absolutely essential thing to do that essentially all high school students fail to do. This problem is so prominent, that drawing from direct observation is now the rare exception among high school art students. Just doing this one directive will distinguish your work from the crowd, and put you light years ahead of other students. It is easy to see why students have only learned to draw from photographs: photographs are much more convenient, and you don’t have to work as hard to get half decent results. However, drawing is not about turning yourself into a human xerox machine and trying to create a perfect replication of a photograph. There is nothing artistic or creative about copying a photograph, it’s simply a sterile, mechanical process that is dull and boring to look at. On top of that, most students will download a poor photograph off the Internet, so the photograph isn’t even one that they shot themselves. In addition to making poor portfolio pieces, drawing from photographs causes students to develop terrible drawing habits that will be difficult to get rid of later. The college freshmen I teach at RISD who haven’t drawn from life before have a very tough time making the transition in college because their drawing habits are so bad. Read this article I wrote about the importance of drawing from direct observation, and about the bad drawing habits that develop as a result of drawing exclusively from photographs. Many students complain that if they don’t draw from photographs, “there’s nothing to draw,” which I find impossible to believe. Self-Portraits drawn from a mirror are a good option if you want to draw faces, you can set up a still life of objects easily, and interior spaces and landscapes are everywhere. Drawing from life is only boring if you decide it’s going to be boring, there’s an entire world of exciting subjects to observe. The French Impressionist painter Claude Monet made hay stacks exciting to paint. Personally, I can’t think of a subject that sounds more dull to paint, and yet he saw beautiful light and color in those hay stacks and created extraordinary paintings. Be the exception and do not copy your work from photographs or other sources. This means no fan art, no anime, no manga, no celebrity portraits, nothing from another artist’s work. The student did this charcoal drawing above, completed the drawing by setting up a chair in a dynamic position and then arranged shoes throughout the scene to create a lively composition. He took the self-initiative to construct a set up that would be visually exciting to draw from. Take the time to create subjects that you’re engaged in, you won’t always stumble on an interesting scene to draw, sometimes you have to take the initiative to create it yourself. Below is a drawing in color video tutorial that demonstrates from beginning to end, how to draw a still life from direct observation using crayons. 2) Have a variety of subject matter. This demonstrates your willingness and interest to work with different subject matter. Figures, self-portraits, still lifes, landscapes, interiors, are all excellent subjects to address in your portfolio. Admissions officers don’t want to see a portfolio of twenty self-portraits. A portfolio with only one topic comes across as narrow minded and limited. Students are always asking me how much they are expected to show works that are related to their intended major. Most art schools will not expect you to already have expertise in the field you are planning on majoring in during college. For example, if you want to major in Graphic Design, your portfolio should not be 20 graphic design pieces. You can certainly include perhaps 1-2 graphic design pieces if you have them, but overall you should focus on showing that you have a wide, well rounded skill set. 3) Demonstrate brainstorming, thinking, & ideas. Keep in mind that Admissions officers are looking to see much more in your portfolio than several classroom exercises; they want to see that you are able to express an opinion, a narrative, a mood, an emotion, perhaps a political statement even, etc.-whatever it is that you want your artwork to communicate. Show in your pieces that you are engaging with your subject matter beyond just being visual eye candy. Create several pieces for your portfolio that show that you are thinking about your subject matter, and brainstorming ideas for your pieces. If you’re looking for ideas for subject matter, check out our Monthly Art Dares, (watch video above) where every month we offer a new art challenge for you to create. You can win tons of art supplies too! This video tutorial on Digital Illustration below demonstrates how to find an idea, develop it, shoot your own reference photos, and then to finally transition into the final piece. This video tutorial below shows the techniques for creating multi-color linoleum block prints, and shows how to brainstorm to create an editorial illustration based on a newspaper article. 4) The vast majority of your portfolio should be finished artworks that are neatly presented. Unless the school specifically requests to see images from a sketchbook, assume that they want to see finished artworks. It would be find to include 1 image or 2 of a sketchbook that demonstrates your thinking, sketching, and brainstorming process, but probably no more than that. Be sure that everything else in your portfolio is a work that has been 100% fully realized. This means no white backgrounds, no dirty fingerprints, no random sketchbook drawings, no ripped edges, no half finished figures, etc. This charcoal drawing below by one of my students has some good qualities, but the student completely neglected to extend the drawing to the edge of the paper, making for a sloppy and unfinished presentation. The quintessential problem I see in artwork by high school students is not bringing a piece of a full finish. Many portfolio pieces I see by high school students are only about 50% finished, and have big problems like glaringly empty backgrounds and lack detail. The majority of students stop working on their projects prematurely, which leads to works that are unresolved. Read this article for more on how to bring your artwork to completion, and this article for techniques to determine when an artwork is finished. 5) Demonstrate versatility in a range of different media. This exhibits that you have taken the initiative to learn and hone skills in contrasting media. It shows that you have more than one skill set, and can move fluidly from one media into the next. Include drawings, paintings, sculptures, mixed media, digital media, printmaking, or anything else that you’ve had experience with. Make sure that you have both black and white pieces as well as works that display a full range of color. The color pieces you show in a portfolio should demonstrate that you can use color in different capacities. You can include some monochromatic pieces, some pieces that have a more subdued color palette, or a pieces that use highly intense, saturated colors. Artworks in 3D media can really make your portfolio stand out. Most students have very little (if any) experience with 3D media so make an effort to do so if it’s within your means. Below is a simple portrait sculpting video tutorial using air dry clay. I recommend doing drawings in chalk pastel or Caran d’Ache crayons. The best brand of chalk pastels is Rembrandt, but be aware that this brand is expensive. A more affordable brand that has decent quality for chalk pastels is NuPastel. Make sure with chalk pastel drawings that you’re using a neutral colored pastel/charcoal paper, white paper is nightmare to draw on for chalk pastels. For Caran d’Ache crayons, I recommend drawing on black or neutral colored mat board. 6) Strong drawings are critical. Accomplished drawings are the heart of a successful portfolio when applying at the undergraduate level. You might have 15 digital paintings, but none of that will matter if you have poor drawings. In terms of drawing media, the vast majority of high school students are creating tight, conservative, photo realistic pencil drawings drawn from photographs. Drawing is not about just copying a photograph as accurately as possible; we now have cameras that can do this instantly with incredibly precision and quality. Ask yourself what you can express with your drawing that a camera would not be capable of producing by itself. This charcoal drawing tutorial I did shows the entire process of creating a portrait drawing in charcoal from beginning to end. Instead of limiting yourself to just drawing with pencil, experiment with other drawing materials such as charcoal, conte crayon, chalk pastels, Caran d’Ache crayons, india ink, oil pastels, markers, etc. Charcoal in particular is a great drawing material because it motivates students to develop an approach to drawing that is bolder and more physically engaging. Just using these drawing materials will distinguish you from the other student portfolios, and will inspire you to experiment with drawing in a bolder and looser manner. 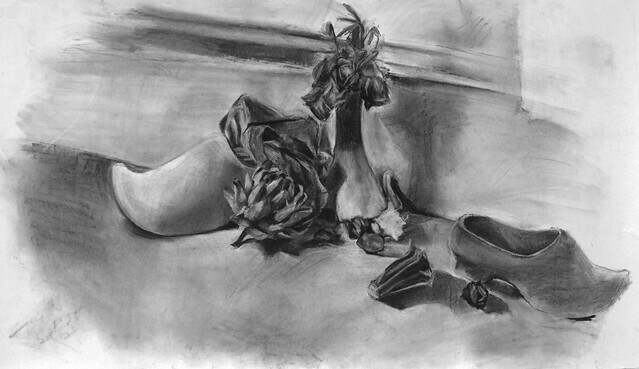 This student charcoal drawing below was drawn by directly observing an artichoke, and then repeating the artichoke multiple times throughout the composition by drawing it from different points of view. Read this article I wrote for how to practice drawing, and this other article I wrote for how what kind of mindset and approach is necessary for drawing. If you don’t have access to rigorous art classes at your school, a good option would be to watch our free video tutorials on artprof.org. 7) Have excellent photographs of your artwork. One of my colleagues once said to me “As artists, we live and die by our photographs.” In a portfolio situation, this could not be more true. A poor photograph of your artwork is hugely distracting and can really make or break an admission officer’s initial reaction to the work. A quality photograph of your artwork will have 1) even lighting, 2) be neatly cropped in Photoshop, 3) be appropriately color balanced, 4) be in focus, 5) taken on a DSLR digital camera. Smart phones today have excellent quality cameras that are probably acceptable, but nothing beats the quality of a DSLR camera. The student collage seen below has all of the requirements for an excellent photograph. Ideally, it’s best to hire a professional photographer to shoot your photographs, but that is astronomically expensive. You can do it yourself by investing some standard photography equipment. Purchase a kit with 2 stand lights with umbrellas, with photo flood bulbs that are 250 watts to 500 watts each. These lighting kits aren’t super cheap, but regular incandescent and florescent lighting is not sufficient to produce high quality photographs. Regular lights will not produce the color accurately, and you will not get good focus because the lights are not bright enough. Set up the two stand lights so that there is one on the left, and one of the right, with your artwork on the wall in between the lights. Having the lights directed from the left and right of the artwork creates lighting that will move evenly across the artwork. 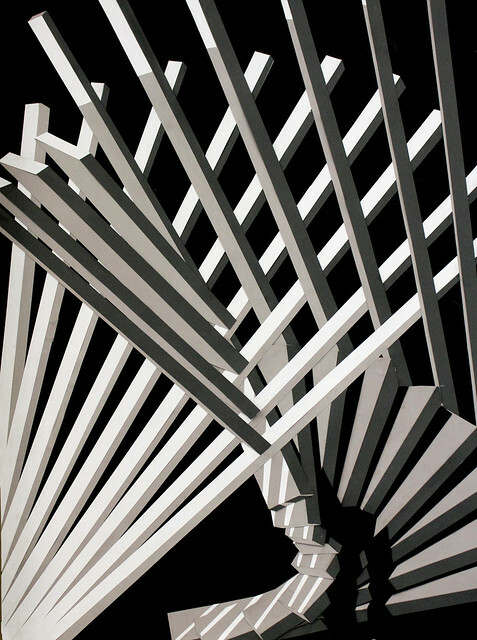 Depending on the colors in your sculpture, choose either white, grey, brown, or black to create contrast so that the sculpture is visible against the back drop. In the case of the student sculpture below, the white background is a poor choice because the sculpture is also white. Therefore, the photograph lacks contrast and the sculpture is difficult to see. In this photograph below, the grey background allows the white sculpture to be much more visible. Additionally, the shadows are much darker and the contrast of the overall photograph is much crisper and stronger. Tape the top of the paper roll to a board behind the artwork, and then gently pull down the paper roll so that it falls on the surface of the table. Tape the paper to the table so that it is secure as you photograph. The roll of paper provides a smooth, clean, neat background for the sculpture to sit on. Too often students shoot photographs of 3-D work with distracting backgrounds. A chronic problem is placing the sculpture on a table against a wall, creating an ugly horizon line between the table and the wall which looks terrible. Use natural light from a window if you can to light the sculpture, this will create soft shadows to articulate your piece well. If you don’t have a window available, use one of the stand lights from the lighting kit with a lighting umbrella to create a shadows that are more diffused and soft. When the shadows are too harsh, they can make your sculpture look flat and they will lose their sense of volume in the photograph. Avoid these problems: 1) uneven lighting where cast shadows visible, 2) glare on oil paintings, 3) have distracting background behind the artwork, 4) have inaccurate color, 5) be out of focus, 6) taken on a smart phone. Creating a portfolio should not be an effort that you have to do entirely on your own. Think about it this way, would an aspiring concert pianist who is trying to get into Julliard try to figure out how to play a Rachmaninoff piano concerto on their own with no piano teacher? Visual arts is no different from any other field, you have to get an outside opinion to improve. Take the initiative to get a critique to an art teacher whose opinion you trust to get a thorough portfolio critique. Or even better, ask a professional artist, or a an art professor who has experience helping students get into an undergraduate program. Watch the video below to get a sense of what a professional art critique involves, and what to expect. An art teacher can aid you in weeding out the weaker works, and provide invaluable advice about what direction to head in. Don’t rely only on yourself (or family members) to make decisions about what works go into your portfolio. All art students and professional artists get stuck in their heads when looking at their own artwork, and frequently they aren’t able to make sound decisions. Another eye will provide a fresh perspective and objectivity to the evaluation process. Another option is to take a weekend or night class at a local art school, museum, or art center. The instructor at one of those classes might be able to help you with your portfolio. Unfortunately, course offerings for high school students in the visual arts are terribly meager, so you might actually do better and have many more options looking at adult continuing education courses aimed at a specific medium you’re looking to improve in, such as drawing. Many art schools and colleges also offer summer courses at the college level, and you might consider attending a residential pre-college program at an art school like the six week RISD Pre-College program. You can read about my own experience teaching at and attending RISD Pre-College back in 1993 here. For every high school student, trying to do prepare a portfolio entirely on their own is daunting, and having the structure of a class or summer program can be enormously useful to stay on track. Finally, the real test of the strength of your portfolio is attending a local National Portfolio Day event, where representatives from art schools and colleges with solid art programs across the country are available to critique your portfolio in person. Be ready for very long lines and huge crowds, especially at the big name schools like RISD. The first year that I went as a junior in high school, despite having waited 2 hours in line, I didn’t even get a review from RISD because the line was so obscenely long that at a certain point they just turned people away. The second year I went, having learned my lesson the year before, I went to wait in line for the doors to open two hours in advance. I was the first person in when the doors opened, and raced immediately to the RISD table. At this event, brace yourself for harsh words. It’s not uncommon for students to be told at National Portfolio Day that they essentially have to start over from scratch because their portfolio is headed in the wrong direction. Reviewers will be candid and direct about the quality and type of work that their school is looking for, so don’t be discouraged if you get a tough critique. Rather, be glad that you got the feedback you needed to get yourself headed in the right direction. Be prepared for a wide range of different opinions, and critiquing styles. Some reviewers are concrete and helpful, while others can be less so. This post I wrote talks about tips for how to present your portfolio, and how to interact with admissions officers at the event. Many students don’t know how to present/prepare their artwork in a way that is practical at an event like this, and surprisingly, some students can be rude to the admissions officers who are reviewing their portfolios which never serves you well. Keep in mind that a portfolio review from any school is valuable, especially the ones that are critical and offer feedback and how to improve. It’s not always fun to hear your artwork criticized, but remember that you’re not at National Portfolio Day to have your ego massaged. You’re there to figure out what you can do to improve portfolio, and see how your portfolio will hold up in the competitive college admissions process. Artprof.org has a free Art School Portfolios Course, which greatly expands on the content in this article, which includes videos of art school students giving tips, a gallery of student portfolios, and more! Need more help? Have more questions? Contact us at Artprof.org, we are happy to help! I also made it to RISD but I didn’t have any works drawn from real life. I only drew and painted from photographs. I don’t understand why it is important to draw from direct observation. I think working from direct observation severely limits the range of themes or subject matter in your work. It’s just my opinion. The nuances of light, shadow, richness of color, the real life/vibrancy/energy from the subject and,sometimes its environs, become dulled or muted when reduced to 2D reproduction. The quality and manipulation of the photo (and various other aspects, can also hinder the quality of your drawing; like a xerox of a xerox). How would you suggest a portfolio should be presented, when all the works are loose? Depends on who and where you will be presenting your portfolio. What context will you be showing your work in? Just buy a portfolio that has nice plastic sleeves that you can insert your work into, that should work fine. Thank Jesus I found this, lest my SCAD portfolio be awful…. Yes, the portfolio is absolutely required, there’s really no way around it. Thank you for your reply therefore art school are really depending on the protfoilo more than grade ? Both grades and the portfolio are important. Art schools have become very competitive over the past decade so don’t think that you can get in with poor grades if you have a good portfolio. How would you show your clay pieces in a portfolio? Do i just take pictures of it? Yes, but make sure the photographs of your clay pieces look professional; have good lighting and a clean background. When you say we shouldn’t copy pictures from photographs do you mean we should just draw what we see in our heads? Can we not even use a photograph for guidence? Draw from direct observation. I don’t recommend drawing out of your head. Drawing from a photograph “for guidance” is the same thing as drawing from a photograph. I think a limited portfolio is not ideal. I would give yourself at the very least, 6 months to create substantial, finished works for your portfolio. For people who want to do illustration, is it ok to have fan art in a professional portfolio and not a portfolio for college application? For example, in one of my design classes we had to make a book cover for a pre-existing book…could I include that? And some of the people I know in illustration classes also had to illustrate from books that already exist as well. It is never, ever good to have fan art in any portfolio. By fan art, I mean drawings of celebrities and other characters that are not your own. That’s basically the kiss of death, and will immediately cause people to see you as nothing more than a hobbyist. Book covers by pre-existing books in your portfolio are fine. Thank you! Does that include characters from Greek mythology and classical literature? Just making sure. Characters from mythology/classical literature are fine, as long as the designs are yours and not derivative of other artists’ versions. Do you need to include a description with the work you include? It depends on the school, check the individual school’s requirements. I have never really strayed from drawing and painting from pictures. How do you suggest I start drawing from direct observation? Like what is best to draw to introduce me to drawing what is infront of me if I’m forign to the procedure. I’ve only got under six months. Are studies acceptable in portfolios? Probably not, unless the school specifically requests to see them. I would assume generally that only finished works should be in the portfolio. I’m going to apply environmental design, how many landscapes and interiors should I include in my portfolio? Is it important to be creative? There is no set number of landscapes or interiors to include in your portfolio. Check with each individual school’s requirements to see specifically what they are looking for. Creativity is one of the key components of the portfolio. I’m applying for the BFA program at DigiPen Institute of Technology, and i’ve got a portfolio of 18 drawings, where 10 are direct observations, and i have several paintings, and 2 cartoon renditions of my little sister and my cat in different positions. I’m applying in mid to end December, are 18 drawings a good number when the required amount is 15-20? And is having taught myself how to draw an impressive feat that improves my chances of being accepted? Your advice was really helpful, thanks lots! I’m sure 18 pieces is fine if they are requiring 15-20. To be honest I don’t think the admissions committee will take into consideration that you are self-taught, the more important thing is the quality of the work in your portfolio. Good luck! Yes, the title is whatever you want it to be. “Additional information” is probably only necessary if there is something specific about the format of your piece that isn’t apparent in the slide. Most people will leave that area blank, you don’t need to write what inspired you to make the work or the subject matter. There is usually another section where you can write what the medium of the work is. For this one there isn’t a space for medium or date; should I include that? a lot of my pieces are conceptual art; should I explain the concept or leave that up to them? Yes, in that case use that space for put the medium and date. It’s not necessary to explain the concept on your application. Hey, how many pieces would be sufficient? Thanks. i am not very good at realistic art, and i tend to draw more cartoony, will that effect my chances? This website has helped me SO MUCH! Thanks for such a great article. I am applying to the Skowhegan School of Painting and Sculpture and I was wondering if a diverse portfolio with various subject matter and media would be good for this program, or do you think a more focused portfolio would be beneficial? I primarily work in watercolor, oil and murals arts. Thanks! My understanding of Skowhegan is that it is a residency for emerging artists who likely have already finished their art school degrees. For that reason, your portfolio should be much more focused, and show a mature, cohesive body of work that has a specific intent and goal. This is not remotely the same as a portfolio for college admission where diversity in subject matter in media are valued. It might be worth looking up artists who have previously attended Skowhegan and see what kind of artwork they have. That is a great idea I will look some up now. Thank you! Is it fine to create a composition in which some objects are direct observation from say superhero or celebrity action figures not photos. Then these action figures are drawn in a different setting. I would recommend staying away from using images from popular culture, which includes super heroes and celebrity action figures. The risk of the image coming across as amateur and cheesy is very high. You’re better off spending your time drawing from direct observation. Thanks for the great article! How would photography pieces fit into an art portfolio? Should they be included and how much? It’s fine to have a few photography pieces in an art portfolio for undergraduate college admission, however, I would limit the number of photographs you include. For example, if your portfolio has 20 artworks, then I would include no more than 3 photographs. If your portfolio has 15 pieces, then I would include no more than 2 photographs. What if you draw your own original characters that you created? If you draw them in a mature way (more realistic and not cartoony or maybe a mix between realistic and anime style) would that be acceptable? I’m wondering because I have characters that are somewhat humanoid and I was wondering if its ok if you draw your own characters that you created. As long as the characters are original, it’s fine to include. However, I would only have 1 or 2 of your images in your portfolio be character designs. Good luck! Hi! What a great post – I’ve bookmarked this for reference. BTW, I actually just toured RISD last month! Love it! I know you’ve made a very good point on direct observation, and I’m sure to follow it, but I’m curious – I did a 17x24ish graphite self-portrait in my Art III class last year. It took about three months to do, and, you guessed it, it’s based off photos we took of ourselves. It’s possibly the best piece of art I’ve ever done and I even won an honorable mention from Scholastic Art & Writing Awards within my state. I was wondering if you think I should still give it a shot entering it into my portfolios. I’m going to apply for an Illustration and Visual Media course. I create MMVs and AMVs and was contemplating whether I should include them as they do demonstrate my editing skills but they are based on another’s work. I would not recommend submitting any content in an admissions portfolio that is not 100% created by you. If you want to show your editing skills, you’ll need to use video footage that you created yourself. Can I include digital works such as graphic novel and character designs and studies into my RISD portfolio? Yes, but I would make sure that you limit the number of pieces in that genre. For example, don’t send a portfolio that is 10 images of graphic novels and 10 images of character designs. I would estimate in a portfolio of 20 images, limit those to 2 images each. Are there any crucial differences in what content you think should be included in a portfolio when applying to Art Therapy programs as opposed to undergraduate Fine Arts programs? For example, would a diverse portfolio still be important, or would a more focussed body of work be more appropriate? Also, would drawings from direct observation still be an asset or do you think more abstract pieces would be beneficial? Thanks! I actually don’t have any experience with Art Therapy programs, so I really don’t know what they are looking for in a portfolio. Sorry I can’t help! I’m not sure, contact admissions! I need to have an art portfolio for my application for architecture but I’m not sure if I’m allowed to have digital pieces in it. It doesn’t say anything on the website other than that I need 8-12 art pieces. Should I include some digital pieces to show that I’m well-rounded? Yes, digital work is fine to include! Should I start my portfolio early in Junior year? And I’m not a straight A’s student how would that affect me from applying an art school? And how 3 c’s in Math sophomore and freshman and 1 c’s in English also sophomore affect me from going to Art school? I know it sound like a terrible transcript and I’m freaking out because art is what I want to keep doing and I don’t want grade from stopping me. I also applied AP studio art for Junior year is that a great move? And hopefully I will be able to keep up and get a better score than the last two years especially in Math. Can you give me advice and tips? Yes, I highly recommend getting started with your portfolio junior year. The earlier you start the better! Your grades do matter, so I would work on improving your grades wherever you can. The portfolio really is the bulk of your application. AP studio art will definitely help you. hi there! Was wondering what a photography undergraduate course portfolio should include , im sure that it shouldn’t only include photographs, but except drawings what else should it include? You’ll find all the information you need in this Art School Portfolios video course: http://artprof.org/courses/art-school-portfolio/ Good luck! This information has been so helpful! ← Ask the Art Prof: Would You Improve More if You Took Art Classes than Just Studying Art on Your Own?